Fall is here and it's time for mid-semester reviews. We put out an open call to Texas art students to show what they have been making. Chosen from 110 different entrants from around DFW and the state, this year's jurors have chosen the best of the best. Come and see what these young up-and-comers can do. Who knows... You might catch a glimpse into the future of the Dallas art scene? The show will run from Oct.11th to Oct.27th , with a reception on Friday the 11th from 7:00-10:00 PM. This year’s jurors are LauraLee Brott, Jessica Iannuzzi Garcia and Lisa Hees from the McKinney Ave. Contemporary in Dallas, Texas. Also known as The MAC, it is a nonprofit organization that stands as a Dallas advocate for creative freedom offering the opportunity for experimentation and presentation of art in all disciplines. It supports the emerging and established artist’s role in society by providing a forum for critical dialogue with their audiences. This relationship is cultivated through education and innovative programming. Continue reading for more information on each individual juror. LauraLee Brott is the Development Coordinator at The McKinney Avenue Contemporary in Dallas, Texas. She lived abroad in Germany and Saudi Arabia before moving to Dallas in 2000. LauraLee received her bachelors in Interdisciplinary Arts and Design Studies from the University of North Texas in 2010. She is currently studying for her Masters in Art History, with a focus on medieval art, at the University of North Texas. LauraLee is a member of a graduate research team from UNT who will be publishing a volume of scholarship garnered from a trip to the abbey in Maillezais, France. She is a committee member for DCAC’s 2013 Art for Advocacy and has previously worked as a Programming Coordinator for Art This Week. LauraLee is also a contributing artist for an online art collective, womanorial. LauraLee has juried two previous exhibitions, at the Visual Arts Guild of Frisco and for Booker T. Washington’s sponsored exhibit, Young American Talent. Jessica Iannuzzi Garcia joined The McKinney Avenue Contemporary as Development Coordinator in 2010 until 2013. She currently serves as The MAC’s web manager as well as committee member on The MAC PAC (Professionals + Artists Collective). In July 2012, Jessica co-founded the website womanorial.com, an online platform claiming a mobile space for artists who contemplate the ever-changing concept of the feminine. (wo)manorial has featured four online exhibitions and a physical show at the Goss-Michael Foundation in February 2013. Jessica was originally trained as an artist and graduated from Parsons The New School of Design in 2010 with a concentration in photography. Lisa Hees was born and raised in Houston, Texas, moving to Dallas in 2005. She earned her Bachelor of Arts degree in Art History from the University of Texas at Arlington in December of 2009. In her undergraduate studies she was recognized with an award for “Outstanding Senior in Art History Research” by Robert Hower, Chair of the UT Arlington Art and Art History department. Lisa is currently Executive Director at The MAC is involved with community based projects and organizations including the Dallas Children’s Advocacy Center and the Dallas Art Dealers Association. Recently, Lisa was a selected Juror at the Visual Arts Guild of Frisco and the Business Council for the Arts annual On My Own Time art show. 500X Members Show Kick Starts 2013-2014 Season. DALLAS, Texas (Aug, 2013) – The members of 500X Gallery have locked up their summer homes, landed their private planes and docked their yachts for the summer, ready to get a jump start on this year’s exciting exhibition calendar! Consider this a tasting menu of what is to come. So get out and check out what Texas’ oldest artist run gallery space has to offer. Presenting new work from everyone, the Members Show provides a great example of the varying mediums and styles that are present within the group. From painting to photography to conceptual art, 500X is ready to show why it has been around for so long. And why it is here to stay. So you better get used to it. The current list of 500X members includes (in alphabetical order): Bernardo Cantu, Colette Copeland, Diane Durant, Michael Francis, Timothy Harding, Clayton Hurt, Joel Kiser, Shelby David Meier, Bruce Monroe, Chancellor Page, Elaine Pawlowicz, Irby Pace, John Alexander Taylor, and Giovanni Valderas. Exposition Ave., Dallas, TX 75226. Regular gallery hours are from 12:00 PM – 5:00PM on Saturdays and Sundays, or by special appointment. P.S. We will be accepting submissions for our annual college expo starting September 1st. Get your images ready. Don't worry... We will remind you again. 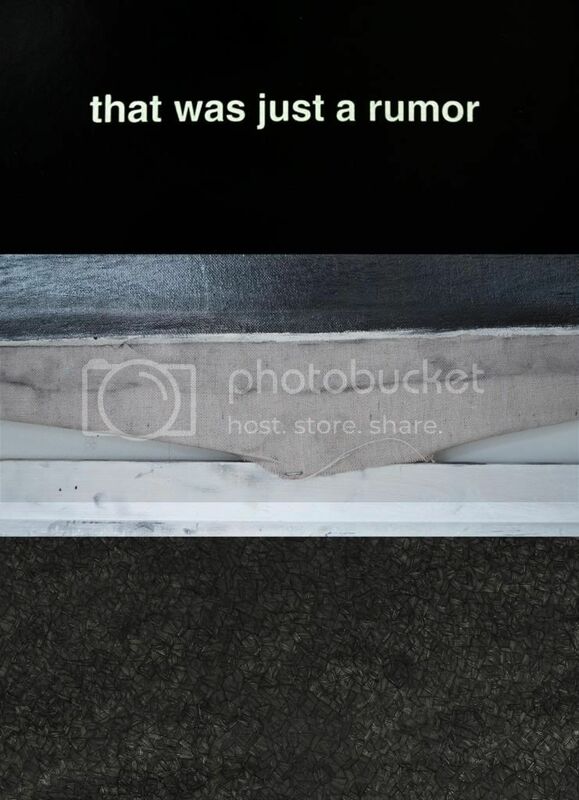 (image detail) That was just a rumor (2011), gelatin silver contact print, 6x6". New installations by Diane Durant use photographs, texts, and objects to construct both stable and unstable narratives. These "true stories" retell experiences from the artist's past and explore ideas of memory, double literacy, and the veracity of the photographic image within a narrative sequence. (image detail) Graphite, Canvas, Stretcher, 2012, graphite on canvas. New works by Timothy Harding act as moments that have been dislocated from their source. Through reference to recognizable but otherwise unknown subjects, these drawings challenge the viewer's understanding of perceived reality by existing somewhere between fact and fiction. (image detail) Untitled, 2013, Ink on paper, 60x83''. New drawings by L.E. Doughtie are an investigation into scale, constructed with consuming and meticulous mark. Joel Kiser's current body of work explores traditional cast narratives or "kitschoclasms" as he calls them. These works are born from the insights and lunacies of Mad Magazine, National Lampoons, and the Weekly World News genre of thought. Joel finds these kitsch objects or characters waiting for him to be repurposed using the surface vocabulary of 1980's fanboy culture. From the cast forms Joel charges these cast vignettes with the old genre of "tall tale" fables whose residue boils down to an experiment with the "National Inquirer" laboratory of meaning, where the fuzzy boundaries separating reality from representation are constantly being redrawn. con·tin·u·um - A continuous sequence in which adjacent elements are not perceptibly different from each other, although the extremes are quite distinct. Taking note of coincidences is akin to the kind of observation a landscape or portrait artist practices. Thus, my observations take the form of hand-stitched texts that I call Common Threads. Sewing every line, letter, and illustration in the books enhances their status as objects. By laboring over a dime store composition book, painstakingly recreating it by hand, I have found a way to express the insignificant as potentially philosophical. Just as a landscape or portrait painter's observations allow them to reproduce a version of reality, my scrutiny of repetition creates a narrative that navigates fictional universes. Studying coincidence led me to other speculative areas of science and the paranormal. My work customarily explores the aesthetic and narrative possibilities of crop circles, secret societies, and alchemy. This interest in pseudoscience developed into an alternate version of string theory to explain the occurrence of coincidence. Most of my projects take the form of books or series of prints as each represents an inquiry or sustained reflection on a given subject. Like the patterns the covers of composition notebooks, patterns in fictional universes can go unnoticed without the care of sustained scrutiny. I just happen to be the one paying attention. Deriving its name from Jameson’s thoughts on consumer society and notions of false realisms, THE LANDSCAPE IS MOTORIZED exists somewhere between experimental place making and dimensional exploration. Artists Nate Glaspie and Shelby David Meier address issues of consumption and waste within contemporary culture. Influenced by vacuum-form packaging designs, Glaspie's new series Prop 65,re-constructs the integrity of unnoticed designers within corporate America. Referencing multiple subjects surrounding popular culture and art history, Meier's work Surrogate Icons and Activities creates a conceptual web centered around technology, consumption and originality. Shayne Murphy's paintings incorporate the figure within invented and ambiguous spaces to invoke a sense of exploration and discovery. The relationship between the figures and the spaces they occupy take on the role of a transient, protector, destroyer, or remain obscured. Fusing figurative realism with linear abstraction, Murphy seeks to create a hyper-reality that acts as a manifestation of the real and imagined. He is interested in humankind's innate curiosity of the unknown and our desire for escapism. Shayne Murphy - Surfacing, 2013, Oil on panel, 62" x 48"
Show your work in Texas' oldest artist-run space! 500X GALLERY MEMBERSHIP FOR THE 2012-2013 SEASON, DUE DATE IS MAY 1. EXHIBITION PROPOSALS: UPSTAIRS GALLERY FOR THE 2011-2012 SEASON, DUE DATE IS MAY 1. Applications are due May 1, 2011. If the submission is accepted, a contract will be discussed. 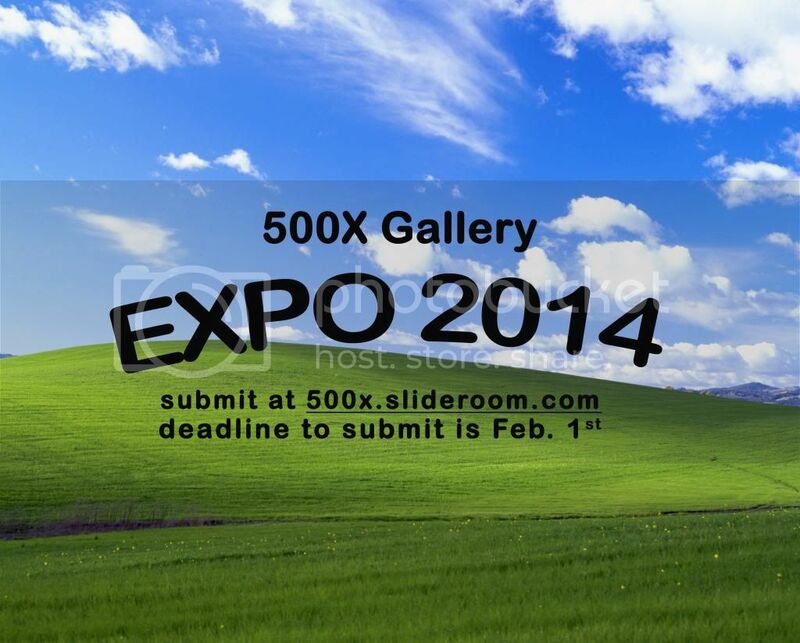 The 500X EXPO is a juried exhibition open to any artist within Texas. Artists may enter up to 3 images/videos (including details) for a total submission fee of $30. Delivery of work is the responsibility of the artist and must be delivered on the designated dates, unless special arrangements are made. Work can be delivered on Feb. 8th or 9th between 2 PM and 5 PM. You will be notified by email or phone if your work is selected. Please do not try to contact anyone if you do not receive any notice. Opening Reception: January 14, 7-10 p.m. The work presented in this exhibition reexamines Clayton Hurt's depictions of animals with humanistic attributes. Figurative animal forms, funny faces and recycled dog toys lean toward the twisted comical side of entertaining. A moment in time is frozen, as you ask yourself, "Why am I in this place surrounded by such odd things and why do they seem to enjoy my presence?" Kerry Pacillio, inspired by 1980's films, presents new work about the chaos of adolescence, the ceremony of girlhood, and the environments inhabited during the passing of those times, ranging from campy to creepy, from banal to exceptionally abnormal. New works presented by Timothy Harding find inspiration from the unconventional writing technique of American author William S. Burroughs. Timothy applies Burroughs' techniques to his own process. Through a series of actions including stacking, arranging, and cutting, Timothy is able to explore the notions of chance. The resulting works have a sense of a presence that shifts in and out of focus. Diane McGurren's work explores the banalities and eccentricities of the disappearing American landscape through medium format photographs, found text, flat tires, and other road trip ephemera. This summer Diane traveled the space between Cool, Texas and Cool, California and Cool, Iowa. This is what she found there, and then some. Opening Reception: Saturday, September 10, 7:00 - 10:00 p.m.
FRESH MEAT: 500X College Expo Opening October 15, 7-10pmJurors: Cris Worley and Erick SwensonSubmissions Deadline: Sept 28, 2011 About FRESH MEAT: 500X College Expo500X Gallery, Texas' oldest artist-run space, continues our annual juried show for college students! Like the annual Expo juried show, FRESH MEAT: 500X College Expo aims to bring together artists from around the state. The exhibition offers college students an opportunity to enter into a dialogue with their Texas-based counterparts and to see work by their colleagues at other institutions. The exhibition will offer visitors an overview of the variety of perspectives that exist throughout colleges and universities in Texas. The exhibition is open to all artists enrolled in college-level courses in Texas. The entry fee is $30 for up to 5 images (includes details of work). All visual media are eligible, including drawing, painting, photography, sculpture, installation and video (artist must supply all required electronic equipment). Artists will be notified via email Wednesday, October 5 by 8pm if the work has been accepted into the exhibition. If you do not receive an email, your work has not been accepted. Work must be exhibition ready (with securely attached D-rings, cleats, etc). Works without hanging hardware- even if accepted by the juror- will be accepted for the exhibition, and there will be no refund of the entry fee. Complex installations will be considered only if the artist is available to install. During drop-off, accepted entrants must show a current student ID and a printout of their Fall 2011 class schedule; there are no exceptions to this rule. Securely label each work with your name, title of work, media, dimensions, date of execution, and price. You will be asked to fill out a form with this information for our records again on site. The gallery retains a 40% commission on all artwork sold during the exhibition. About the Jurors Cris Worley has over a decade of expertise in the field of contemporary art. She has successfully directed two prior art galleries, most recently the Dallas branch of the internationally known PanAmerican Art Projects. In January 2010, she launched Cris Worley Fine Arts, a full-service art consulting and advisory firm, opening an exhibition space in Dallas, Texas shortly thereafter. Cris holds a Master's Degree in Art History from Southern Methodist University and a BFA in Art History from the University of the South. In the last 10 years, Cris Worley has participated in art fairs throughout the US, Canada and Europe, including Scope Basel, Switzerland, The Los Angeles Art Show, and Art Toronto, and has programmed and curated over 70 exhibitions.